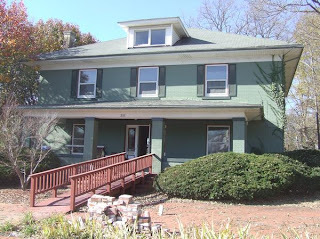 Student Support Services will move this month to a house on Tenth Street just south of the main Columbia College campus. Its new home will be across the street from the old Columbia Photo building, which soon will house the college’s Online Campus. Although the move offers some benefits, some students and staff members of Student Support Services have expressed mixed feelings about it. Nancy Lombardi, director of Student Support Services, said the move has “a few minuses, but many plusses.” The new location will give Student Support Services more space and features it has never had before, she said. They will have a kitchen and dining room, which will be useful for off-campus students to bring their lunches as well as a yard to have outdoor activities. An academic plus is more individual study space for students. Lombardi also said the availability of parking is a huge plus. The house has 11 parking spots and an 80-spot parking lot across the street that will be available for off-campus students and staff with permits. Lombardi says she hopes students will park their cars nearby and visit Student Support Services before class. When they are done for the day, students can return to Student Support Services. Some students are excited about the move. Melody Wisswell and Tony Goodholm, both seniors, say they can’t wait for the move to happen and to enjoy the new kitchen, something Student Support Services does not have in its current location. Despite the benefits of the new space, Lombardi said that a big minus could be its location off the main campus grounds. She expressed concern that few students will be able to visit Student Support Services between their classes. Deanna Pettit, freshman, and Nicole Kenoyer, senior, share Lombardi’s concerns about the location. Pettit said she isn’t sure how often she will visit Student Support Services after the move, and Kenoyer said the off-campus location is farther than her own dorm room. Tery Donelson, assistant vice president of Enrollment Management, said Student Support Services is moving for two reasons. First, the college bought the house and needed someone to occupy it. The initial idea was to move Financial Aid, but Donelson said he realized that Financial Aid is too big and also works closely with other departments in Missouri Hall, so a move for that department might be counterproductive. Therefore, the decision was made to move Student Support Services because it is the only department that is not interdependent with others. The second reason for moving Student Support Services is growth at the college. New staff members were needed for Administration, Enrollment Management, Evaluations and Registration and Financial Aid. With the addition of eight positions in these departments, the space Student Support Services currently occupies will be become their office space. The move originally was planned for Thanksgiving break but has been delayed, said Lombardi. The move will be the fourth in nine years for Student Support Services, and Lombardi said she hopes it will be the last. Student Support Services’ new location on Tenth Street. Student Support Services’ current office in Missouri Hall.